Last week saw me venture into that there London for the launch of a new picture book – South, by Daniel Duncan. Now, nearly seven years into this parenting journey I think I’m a bit of an expert when it comes to children’s picture books. Across Little Miss C and Master C’s bedtime stories, I must have read hundreds of picture books together. Some of them have been good. Some of them have been bad. Occasionally you’ll get one that totally stops you in your tracks, and that’s exactly what happened when I first read South last week. It’s so hard to put my finger on exactly what it is with South that makes it so magical, but it is utterly so. Everything about it works so perfectly. 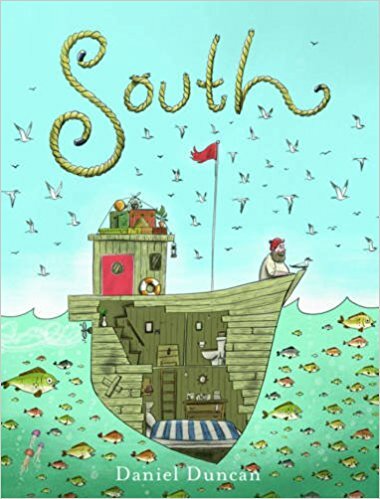 South tells the story of a lonely fisherman who find an injured bird on his boat. After fixing the bird’s wing and nursing him back to health (including playing the banjo and singing to him! ), he realises that the weather is getting told cold for the bird, and his boat is sadly no home for an injured migratory bird. He decides to set his boat on a new course and heads South to take the bird home. South is a beautiful story of an unlikely friendship and how painful goodbyes can be, even when you know it is for the best. Accompanying Daniel’s beautiful story are equally beautiful illustrations. The Fisherman instantly has a warmth to him that makes you feel like he’s an old friend that you’ve known for years. The sort of person that would embrace you in a huge cuddle. Life on board his boat comes alive via the illustrations and the way they feature little details, like photos on the wall and a mug of tea placed to one side whilst the fisherman steers his boat South. 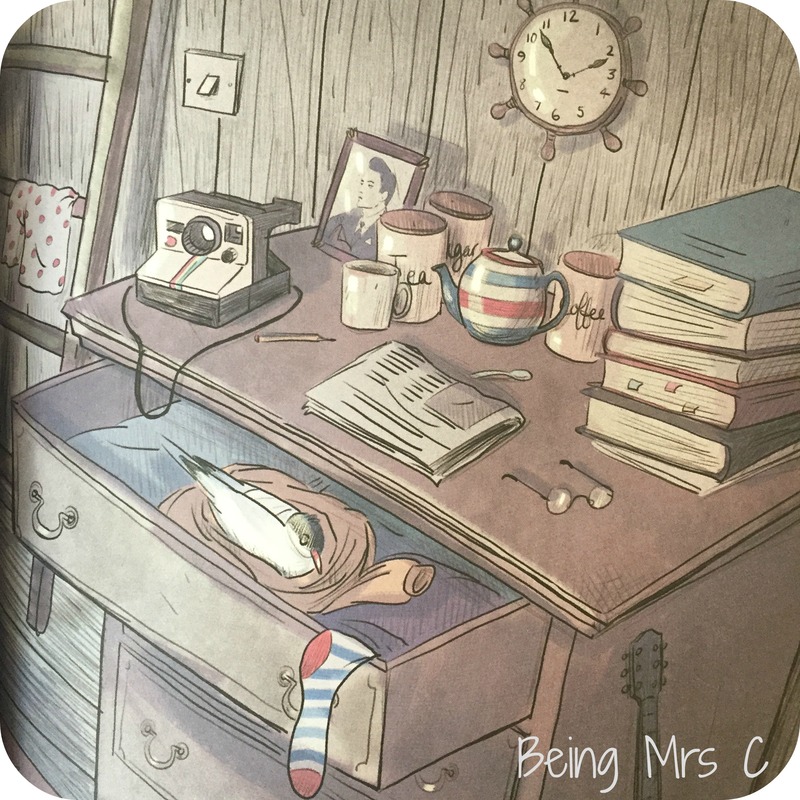 There was also my favourite detail, the inclusion of a Polaroid camera on top of the chest of drawers in his cabin. Such a beautifully retro thing. Inside the front and rear covers of the book are a spread of the smaller illustrations from the pictures inside the book. 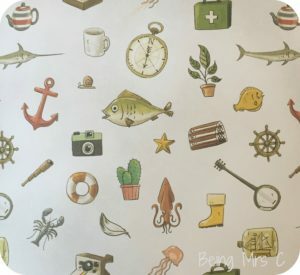 Things like the polaroid camera, a striped teapot and a lobster pod. It’s a design that is just crying out to be made into some wrapping paper, or a stationery range. 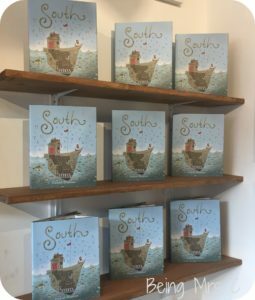 South really is a beautiful tale and it’s hard to believe that this is Daniel’s first picture book. There’s such a familiar and comforting feel about the book, and the fisherman in particular, that it doesn’t feel like the first time we’re meeting them, and I know it won’t be the last. Daniel’s illustration style has a warmth to it that I (and my kids) instantly love, and talking to other people at the book launch I know we’re not the only ones. No doubt about it, Daniel Duncan is a talent to watch. South by Daniel Duncan was published in hardcover by Abrams Books on 2 May 2017. ISBN: 9781419722998 Priced £10.99. Disclaimer: We were sent a copy of South for the purposes of this review. This post contains affiliate links. Mum to Little Miss C & Master C. Crochet addict, radio lover, crafter, runner, tea drinker, WI member, school governor, podcaster & Ladybird book collector. What did you really see today?